Home Directories	Smarty Fall Fashion Giveaway #8: The Funnel by Gretchen Scott Designs! 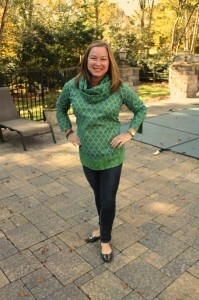 Smarty Fall Fashion Giveaway #8: The Funnel by Gretchen Scott Designs! Gretchen has three flagship stores: Jupiter, Southampton & Nantucket. I’m lucky enough to say that I get to visit these incredible destinations every year. You could say that’s serendipity:-) Not to mention, I’m pretty sure I was wearing a Gretchen Scott Designs piece in almost every photo I was in this summer. And with this new AMAZING Funnel Tunic, I think that trend will continue into fall and beyond! Guess what, Smarties? Y-O-U get to enter a chance to win your very own Funnel Tunic, pattern of choice! The Funnel is the best translation of summer tunic to fall with its unique cowl neck/gathered hood feature. It is stunning and unique – I get compliments every time I wear mine! You can also find Gretchen Scott Designs on facebook, pinterest and instagram. How do I enter to win my Gretchen Scott Designs Funnel Top, valued at $109? 1. Leave a comment below with your favorite Gretchen Scott Designs Fall piece? 2. Bonus Entry: Like CSP on facebook and share this post by clicking the “f” icon in upper left corner of this post. Gretchen has also asked that you like her page on facebook. How could you not?! 3. Bonus Entry: If you are an Instagram user, follow us on Instagram and tag three friends in a comment (pretty please! But not necessary to win). 4. Bonus Entry: Subscribe to our newsletter and include that in your comment. The fine print: We will unveil one giveaway each day this week. One entry per Smarty. We’ll announce our winners on Sunday, November 10th, in the Smarty e-newsletter that goes out every week. So make sure you are an e-subscriber! Tune in tomorrow as we announce our La Senorita Jolie Giveaway! In case you missed a day, here is our complete Fall Fashion Giveaway schedule! Monday, 10/28 – Win a piece from Elizabeth McKay! Tuesday, 10/29 – Win a Holst & Lee necklace and bracelet! Wednesday, 10/30 – Win a Jude Connally dress! Thursday, 10/31 – Win a pair of premium his and her Chip & Pepper jeans, exclusively available at Belk! Friday, 11/1 – Win two pairs of Nordstrom Zella Black Live-in Leggings for mother/daughter! Saturday, 11/2 – Win an outfit from The Impeccable Pig in Shops at Morrison! Sunday, 11/3 – Win a piece from Laura James jewelry collection! Monday, 11/4 – Win a Gretchen Scott Funnel Top! Tuesday, 11/5 – Win a piece from La Senorita Jolie! Wednesday, 11/6 – Win a sercie from Sercie.com! Thursday, 11/7 – Win a piece from Erin McDermott Jewelry! Friday, 11/8 – Win a piece from Ski Country Sports in Park Road Shopping Center! Smarty Fall Fashion Giveaway #7: Earrings from Laura James Jewelry! I think I like the Crazy Quilt dress the best! I like the tunic dress!! 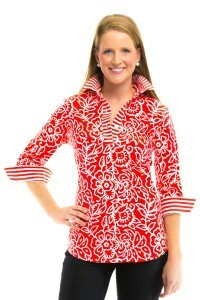 Love, love, love Gretchen Scott—-my fav is Funnel Tunic! crazy quilt dress and the funnel tunic for sure! already a subscriber and a follower. I love the Funnel Tunic! The Funnel Tunic is perfect! Love it! I am a follower on FB and email subscriber! Love Gretchen Scott! Funnel top is perfect! The funnel tunic is adorable! Already a subscriber and follower, but I liked Gretchen’s page. already a subscriber and follower.. love all Gretchen Scotts’s pieces.. love the funnel tunic…. Definitely the funnel tunic. Love the preppy navy and green. Tunic dress is super cute! I love the the funnel tunic! It would be a a welcome addition to my closet. I have loved Gretchen Scott clothes since I was introduced to them right here on CSP! I think the tunics are so stylish and flattering. I’m a big fan of the Poly Georgette Silk Embroidered Tunic in her Fall ’13 line. I think the funnel tunnic. I am an email subscriber. Love the funnel tunic. The geo design in green and navy is sooo cute!! I think all of Gretchen Payne’s designs are a must. Love the funnel tunic! I already like CSP on FB and am a newsletter subscriber. Funnel tunic would be great for the this cool weather and holidays! I love any of the tunics! I love the Cotton Cashmere Tango Dress. I love the funnel top in Bits N Pieces! I like what you’re wearing Jen.